When you integrate Slack with your Assembla repos, all repository stream events will then be posted to a Slack channel of your choice to keep everyone involved informed of repo activity. Interested in integrating Slack with your tickets? Check out How to Integrate Slack with Assembla Project Management. To activate your Slack integration, open the Integrations page and then select Enable to the right of the Slack integration. Then, choose Settings and Authorize Slack to bring up a permissions page. Assembla will ask for access to some information associated with your Slack account. Allow it, and your Slack account will be authorized and ready to go! Then, select the Settings again to view your channel list. You can select the channel you would like to forward your repo events to from the dropdown list, or you can use the text box to search for your channel by name. It's important to note that every Space can have only one Slack channel associated with it. However, each Space can have either a different Slack channel or the same Slack channel associated with it. 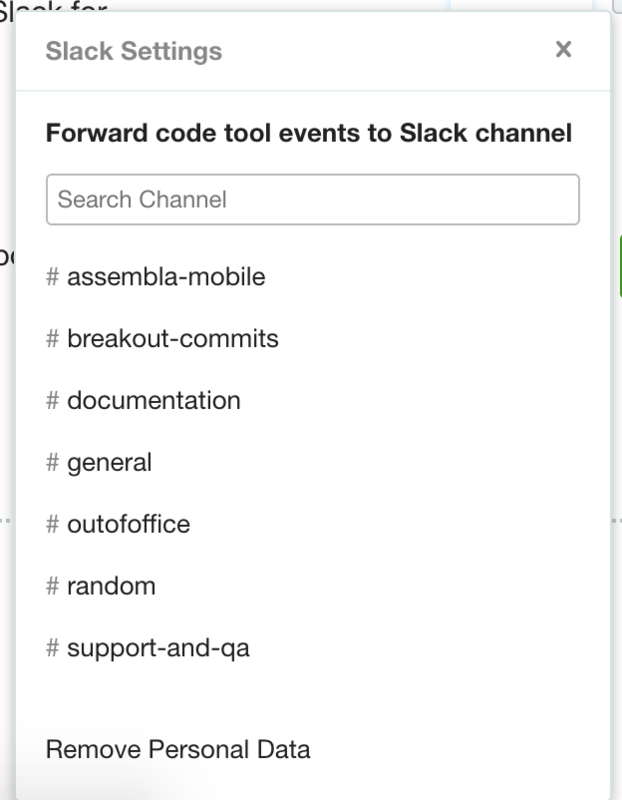 Once you have chosen a Slack channel for your Space, all repo events in the stream for that Space will then be reflected in the channel.